Our 100th Anniversary Year! Join us for our Celebration in October! Children are a true blessing and the future of any parish. As such, our parish offers Sunday School to all children, during service for our youngest and after service for all others, including parents. Why our beautiful Parish? We are here for YOU. СЕРДЕЧНО ВІТАЄМО НАШИХ ГОСТЕЙ ЯКІ МОЛИЛИСЬ СЬОГОДНІ З НАМИ. БУДЕМО РАДІ БАЧИТИ ВАС У НАСТУПНУ НЕДІЛЮ. НЕХАЙ ВАС ОБЕРІГАЄ ГОСПОДЬ. We are a Ukrainian Orthodox Church with services in both English and Ukrainian languages. Each service is bilingual, enabling each parishioner to enjoy and understand the celebration of Orthodox Christianity. Are you a descendent of Ukrainian immigrants? Like many of us, perhaps you grew up in a Ukrainian household in America, and always went to church not understanding the spoken Ukrainian. The hymns are soothing, the incense smell warm, and the icons are beautiful. At Holy Trinity, you'll get to hear our wonderful choir sing the same familiar hymns in English and gain a deeper appreciation of the service and its meanings. Are you a Ukrainian immigrant? 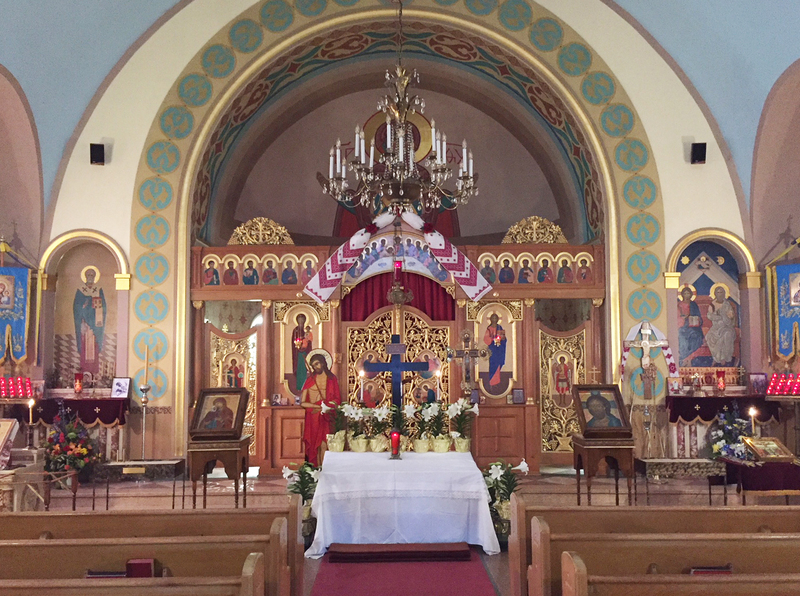 Join our church and worship in the Ukrainian Orthodox tradition, while making American friends with common heritage. New immigrants, and descendents of immigrants worship side-by-side. We learn from each other and share in our understanding of the Orthodox word - in both Ukrainian and English languages. We are an ever changing parish. Our parishioners come from many parts of the globe: Latin America, Asia, Europe and of course, Ukraine. All together, we are devoted to growing our parish and building close ties to the community. We strive for our church to accommodate today's busy family life, while respecting our Orthodox beliefs and Ukrainian traditions. Our goal is to provide spiritual renewal in a world of modern distractions and we are committed to Education and Fellowship. We have a fun Sunday School, an active Sisterhood, a dynamic Board and adult Bible classes. "Sunday Coffee Hour" after service, provides parishioners and guests a forum to openly discuss questions related to Orthodoxy, the church and build strong friendships. The parish is part of the Ukrainian Orthodox Church of the USA, which is in communion with the Ecumenical Patriarchate of Constantinople. Our Pastor is Father Zinoviy Zharsky and we are located at 824 Adeline Street, in Trenton, NJ. The church is off Broad Street, around the corner from the Wells Fargo Bank.